Historical strategy fans who enjoy the likes of Panzer General might be curious to check out this addition to the genre but it's probably going to be a little too simple for anyone but the most casual of players. It's presented nicely but suffers from an overly restricted set of options so while it is challenging, there's just not enough variety of units to keep you hooked. 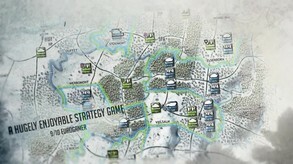 The game gives you the option of controlling either the Allied or German forces during one of WWII's pivotal battles and presents you with a number of scenarios in the treacherous snow-covered forest of the Ardennes. This is a turn-based affair but one where you have to worry about things like your supply lines as well as your troops, while the whole thing is played against the clock, lending another level of urgency to proceedings. You can choose to play against AI commanders based on real-life leaders and which display their own unique personalities or you can take on your friends, while there are also extras like historical information to browse as well as extra options for more advanced players. 1944 isn't a bad game but the biggest problem is the limited number of unit types, with only three available, and which severely restricts the tactical options and sense of immersion. The range of scenarios is also similarly restricted, which again hampers long-term value so while the game is easy to pick and quite challenging, thanks to the smart enemy AI, this is not going to be one you're playing forever, unfortunately.